The time zones observed in North America can be a tricky thing to grasp. Most people aren’t even aware of the fact that certain parts of Canada follow the established standards with regard to the time zones in the USA. One thing that is curious about time zones is how certain locations observe more than one, depending on how close they are to the geographic borders. This is especially true when it comes to those that are under the Central and Eastern Time Zones. There are differences between the observance of Central (CT) and Eastern Time (ET). North America’s Central Standard Time Zone is observed by areas of the United States, Canada, and Mexico. The Central Time Zone is calculated by subtracting six hours from the Coordinated Universal Time (abbreviated as UTC), or five hours if observing Daylight Savings Time (Central Daylight Time or CDT). As of 2007, CST changes to CDT on the second Sunday of March at 02:00 (EST) to 3:00 (EDT). It returns to EST on the first Sunday of November from 02:00 EDT to 01:00 EST. It is referred to as Central Time in the United States as well as Canada, often shortened to ‘Central’ in casual conversation. In Mexico, the functioning time zone is called Tiempo del Centro and is ahead of the Pacific Time Zone by two hours. 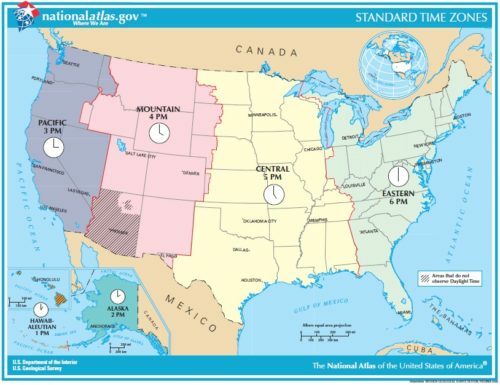 In the United States, the states that generally observe Central Time are Alabama, Arkansas, Illinois, Iowa, Louisiana, Minnesota, Mississippi, Missouri, Oklahoma, and Wisconsin. There are also states that generally observe Central time, but have areas that follow Mountain Time: Kansas, Nebraska, North Dakota, South Dakota, and Texas. The Canadian territories that observe Central Time are Kivalliq Region, Nunavut, Ontario, and parts of Qikiqtaaluk Region Saskathchewan. Although most of Mexico observes the Central Time Zone, some parts observe Mountain Standard Time. The states of Mexico that observe Central Time all year round are: Aguascalientes, Campeche, Coahuila, Colima, Chiapas, Durango, Guanajuato, Guerrero, Hidalgo, Jalisco, Mexico, Michoacán, Morelos, Nuevo LeÃ³n, Oaxaca, Puebla, Querétaro, Quintana Roo, San Luis Potosí­, Tabasco, Tamaulipas, Tlaxcala, Veracruz, Yucatán, and Zacatecas, as well as Mexico City. The Bahia de Banderas municipality in the state of Nayarit also follows the Central Time Zone. On the other hand, Eastern Standard Time is observed by the majority of the East Coast of the United States, as well as some areas of Canada. Mexico does not have areas that observe this Time Zone. Eastern Standard time, abbreviated as EST and informally referred to as ‘Eastern’, is calculated by subtracting five hours from the Coordinated Universal Time; this is changed to subtracting four hours when observing Daylight Savings Time (Eastern Daylight Saving time or EDT). As of 2007, EST changes to EDT on the second Sunday of March at 02:00 (EST) to 3:00 (EDT). It returns to EST on the first Sunday of November from 02:00 EDT to 01:00 EST. The states that observe EST and EDT (when applicable) are: Connecticut, Delaware, Georgia, Maine, Maryland, Massachusetts, New Hampshire, New Jersey, New York, North Carolina, Ohio, Pennsylvania, Rhode Island, South Carolina, Vermont, Virginia, and West Virginia. Washington D.C. also observes Eastern Time. In Canada, the following areas observe ET: Ontario, Quebec, and parts of Nunavut. There are certain areas that share both Central and Eastern Time: some parts of Alabama’s Columbus,, Indiana’s northwestern and southwestern corners, the western parts of Kentucky, and some parts of Michigan and Tennessee. The western part of Florida’s Apalachicola River also observes Central Time while the rest of the state observes Eastern Time. Eastern Time is the unofficial ‘standard’ time for the United States by virtue of having both the capital of Washington D.C. and the city of New York, the largest city in the country. Most media organizations use Eastern Time as the basis for their programming schedules. Specifically, they have Eastern and Pacific Time feeds; the Eastern feed covers the Eastern and Central time zones, while the Pacific feed covers the Mountain and Pacific time zones.) Sports schedules also use Eastern Time when announcing their games. 1. Central Time is observed by parts of the United States, Canada, and Mexico. Eastern Time is observed by parts of the U.S. and Canada; it is not observed anywhere in Mexico. 2.Eastern Time is the unofficial standard time of the United States. 3.Certain states that generally observe Central Time have areas that follow Eastern Time. Difference between N.Z. and the U.S.
Celine. "Difference Between Central Time and Eastern Time." DifferenceBetween.net. May 15, 2017 < http://www.differencebetween.net/miscellaneous/difference-between-central-time-and-eastern-time/ >. this article requires some visual aids like some maps illustrating what is said in the words. why can’t i just get a straight answer? I don’t need to know all of this. I just need an answer “cut and dry” dont’ take me into circles. and I still don’t know how many hours of difference there are….no help at all! Hi there to every body, it’s my first pay a visit of this webpage; this web site consists of amazing and genuinely good data in support of readers.